“One thing I have asked from the LORD, that I shall seek: That I may dwell in the house of the LORD all the days of my life, To behold the beauty of the LORD and to meditate in His temple.” (See Psalm 27:4) In order to find the golden ticket that gets you in the house of the Lord, you must first seek He that hands out the tickets. And the ticket, Charlie, is in every Wonka bar you open. And it’s free. 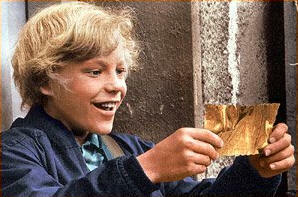 A golden Salvation ticket is just sitting there waiting for you. Jesus already made it happen long before anyone reading this ever existed. He died so that we may live. We just have to believe and walk it out.